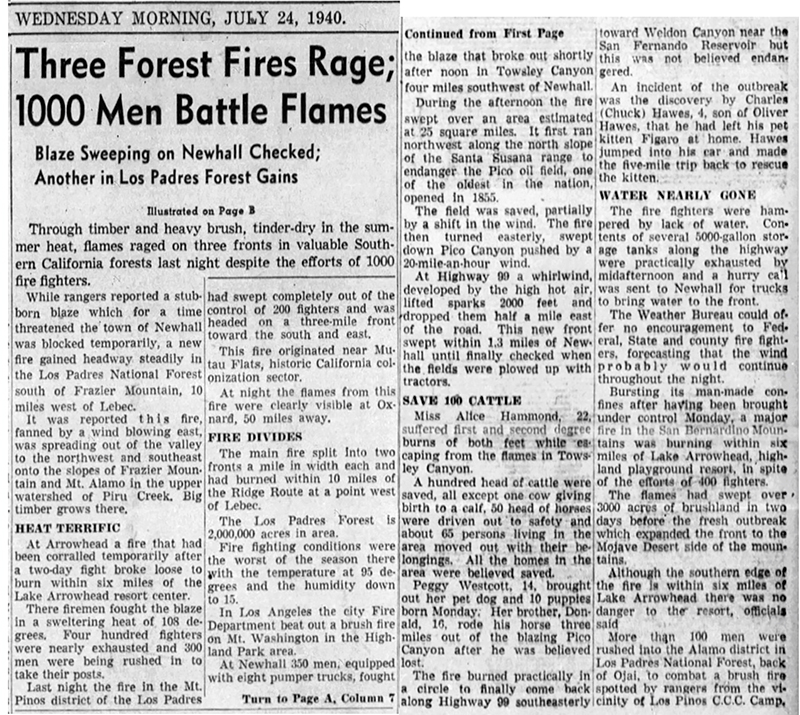 SCVHistory.com | Towsley-Pico | Fire: 'Worst Threat to Newhall Since 1914,' 12 Oil Wells Ruined, Backfire Saves Mentryville, July 1940. Wildfire Sparked in Towsley Canyon. "Worst Threat to Newhall Since 1914," 12 Oil Wells Ruined, Backfire Saves Mentryville. July 1940 | News Reports. Fires Rage on Three Fronts; 1,000 Battle to Save Forests. Blaze Sweeping Toward Newhall Checked by Crews; Second in Los Padres Forest Spreads Out of Control. Los Angeles Times | July 24, 1940. Through timber and heavy brush, tinder-dry in the summer heat, flames raged on three fronts in valuable Southern California forests last night despite the efforts of 1,000 fire fighters. While rangers reported a stubborn blaze which for a time threatened the town of Newhall was blocked temporarily, a new fire gained headway steadily in the Los Padres National Forest south of Frazier Mountain, 10 miles west of Lebec. It was reported this fire, fanned by a wind blowing east, was spreading out of the valley to the northwest and southeast onto the slopes of Frazier Mountain and Mt. Alamo in the upper watershed of Piru Creek. Big timber grows there. At Arrowhead a fire that had been corralled temporarily after a two-day fight broke loose to burn within six miles of the Lake Arrowhead resort center. There firemen fought the blaze in a sweltering heat of 108 degrees. Four hundred fighters were nearly exhausted and 300 men were being rushed in to take their posts. Last night the fire in the Mt. Pinos district of the Los Padres had swept completely out of the control of 200 fighters and was headed on a three-mile front toward the south and east. This fire originated near Mutau Flats, historic California colonization sector. At night the flames from this fire were clearly visible at Oxnard, 50 miles away. The main fire split into two fronts a mile in width each and had burned within 10 miles of the Ridge Route at a point west of Lebec. The Los Padres Forest is 2,000,000 acres in area. Fire fighting conditions were the worst of the season there with the temperature at 96 degrees and the humidity down to 15. In Los Angeles the city Fire Department beat out a brush fire on Mt. Washington in the Highland Park area. At Newhall 350 men, equipped with eight pumper trucks, fought the blaze that broke out shortly after noon in Towslcy Canyon four miles southwest of Newhall. During the afternoon the fire swept over an area estimated at 25 square miles. It first ran northwest along the north slope of the Santa Susana range to endanger the Pico oil field, one of the oldest in the nation, opened in 1855. The field was saved, partially by a shift in the wind. The fire then turned easterly, swept down Pico Canyon pushed by a 20-mile-an-hour wind. At Highway 99 a whirlwind, developed by the high hot air, lifted sparks 2,000 feet and dropped them half a mile east of the road. This new front swept within 1.3 miles of Newhall until finally checked when the fields were plowed up with tractors. Miss Alice Hammond, 22, suffered first and second degree burns of both feet while escaping from the flames in Towsley Canyon. A hundred head of cattle were saved, all except one cow giving birth to a calf. 50 head of horses were driven out to safety and about 65 persons living in the area moved out with their belongings. All the homes in the area were believed saved. Peggy Westcott, 14, brought out her pet dog and 10 puppies born Monday. Her brother, Donald, 10, rode his horse three miles out of the blazing Pico Canyon after he was believed lost. The fire burned practically in a circle to finally come hack along Highway 99 southeasterly toward Weldon Canyon near the San Fernando Reservoir, but this was not believed endangered. An incident of the outbreak was the discovery by Charles (Chuck) Hawes, 4, son of Oliver Hawes, that he had left his pet kitten Figaro at home. Hawes jumped into his car and made the five-mile trip back to rescue the kitten. The fire fighters were hampered by lack of water. Contents of several 5,000-gallon storage tanks along the highway were practically exhausted by midafternoon and a hurry call was sent to Newhall for trucks to bring water to the front. The Weather Bureau could offer no encouragement to Federal, State and county fire fighters, forecasting that the wind probably would continue throughout the night. Bursting its man-made confines after having been brought under control Monday, a major fire in the San Bernardino Mountains was burning within six miles of Lake Arrowhead, highland playground resort, in spite of the efforts of 400 firefighters. The flames had swept over 3,000 acres of brushland in two days before the fresh outbreak which expanded the front to the Mojave Desert side of the mountains. Although the southern edge of the fire is within six miles of Lake Arrowhead there was no danger to the resort, officials said. More than 100 men were rushed into the Alamo district in Los Padres National Forest, back of Ojai, to combat a brush fire spotted by rangers from the vicinity of Los Padres C.C.C. Camp. The Newhall Signal and Saugus Enterprise | Friday, July 26, 1940. At 2 P.M. Thursday a brief communique from the battle front on Oat Mountain stated that the Orcutt Ranch buildings were believed to be safe. Exhausted fire fighters were striving desperately to control a blaze which jumped the fire break near the lookout station. A stiff south wind caused the fire to break into a critical threat about noon Thursday on the Oat Mountain front. The report from Pico canyon stated that the situation was not threatening there. Thursday morning the situation looked favorable, but a high wind changed the picture at noon. The great fire was in no respect under control. It had been confined to a quadrangle bounded on the east by U.S. 99 on the North by Pico canyon, on the west by a line running from the Standard Oil field up to the Santa Susanna Ridge, and on the south by the fire road along the top of the Santa Susanna divide east and west from Oat mountain. 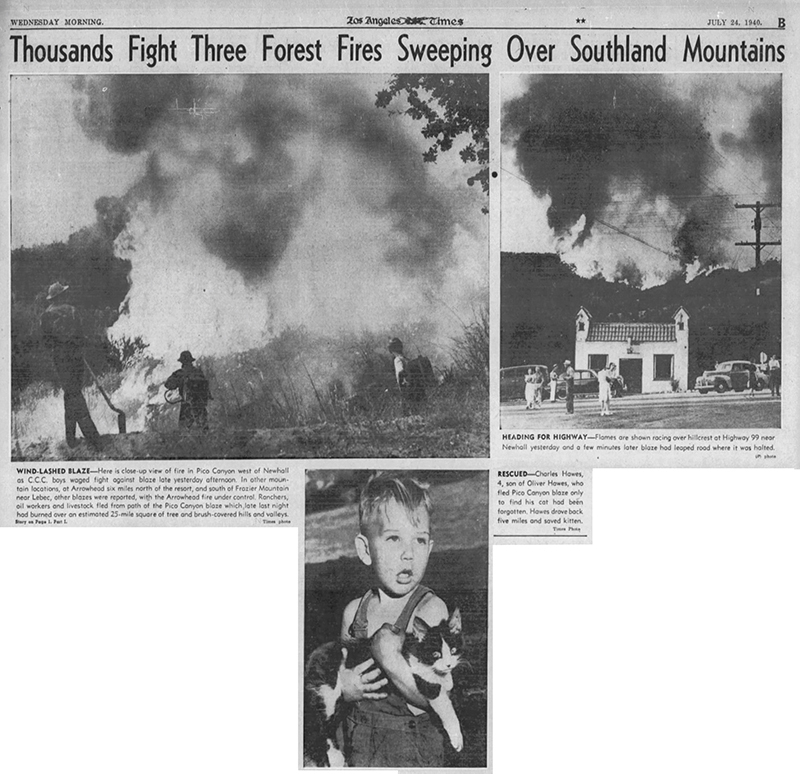 Approximately twelve sections or 8,000 acres were burned over. The property loss was amazingly small. No lives were lost, nor serious injuries reported. There was very little loss, if any, of livestock, although a complete check-up was still to be made. Determined stands made by a force of 700 firefighters, working in relays day and night halted the sweeping blaze. The Pico canyon road, U.S. 99, and the fire road on the ridge were the lines on which the flames were halted. Temporary ditches had stopped the western spread of the fire. Two hundred men with bull dozers were making a new fire break between the head of Pico canyon and the Santa Susanna Ridge. Within the above named limits the fires had practically burned out. People were moving back into their homes. The Pico Oil Field was thought to be safe. The fire was said to be the worst threat to Newhall since 1914. It raged in an area so rough and precipitous that men could not get in to fight it. The most serious threat to Newhall came on the afternoon of Tuesday when a strong west wind carried the fire across 99 into the hilly section north of Pico road. From here the fire ran across the wide flats clear to the next ridge on the north. Heroic work kept this fire from coming any further east. The exact manner of origin of the fire had not been determined by forestry and firemen. According to Mrs. Amy Hawes it began in oil-soaked weeds next to the oil well, but how was unexplained. Fire headquarters was notified at 12:10 Tuesday. Within ten minutes a tower of smoke shot upward out of Towsley canyon as the fire raced through the tinder-like brush. The Hawes family ran for their lives. Strong south wind drove the flames on an ever-widening front to the north. So rapid was their progress that fire fighters could nowhere make a stand, and it was seen that first line of defense was the road in Pico canyon. Apparatus and men were moved in. At two o'clock the fire made its appearance in a deep gully just east of Dewitt canyon. Like a huge blow torch it blasted out of this gully and across the Pico road, going into the ragged hills to the north of the road. Firemen could do nothing to halt the flames and retreated eastward. About three o'clock Tuesday the wind began to shift into the west. Wheeling in this direction the fire front began to race eastward to ward Highway 99. In about two hours it had come within a few hundred yards of the main highway and residents of the Pico crossing prepared to move out. These included the Galbraith Service Station, the Loma Verde Cafe, the Williams residence and the LaCanada Pottery and the Self Help dairy. About four o'clock occurred what was perhaps the most spectacular event of the whole fire. As the flames neared the highway a natural bowl in the hills set up a whirlwind or chimney blast. Like a giant vacuum cleaner the spinning blast gathered up fire, trash and burning brush, tore limbs off of big oak trees and shot a spectacular column of smoke, dust fire and debris hundreds of feet in the air. Leaping across the Pico road this fiery whirlwind got into the brush along U.S. 99, and then with a terrific jump, leaped 100 feet across U.S. 99 and started a blaze in the brush of the hills to the north of Pico on the Newhall side of the highway. The situation was now critical. Backfiring drove the fire front back from the Loma Verde cafe. A defensive front was established in the flats north of Pico and east of 99. For a time this fire threatened all of the property around Pico and U.S. 99. The wind now shifted again into the north. Tractors and plows were used to throw a barrier in the fields at the margin of the brush. This fire was the only one which got east of 99. It finally burned itself out without property damage. In the meantime, the north wind had revived the fire in Towsley and started it scaling the heights toward the Orcutt Ranch and the lookout station on Oat mountain. The fire fighting forces were rushed up on the main Santa Susanna Ridge, while other parties went into the Lyon Ranch, a battle began to keep the fire from taking the buildings fronting U.S. 99. By hard work the Lyon ranch buildings were saved. Back firing kept the fire well back from the highway. As darkness fell the fighters high on the ridge started backfires to protect the south front on Oat Mountain. These fires made a lurid spectacle as they burned on the high ridges all through Tuesday night. Wednesday morning the strong south wind sprang up again. The fire again advanced toward U.S. 99. Fighters were massed along the highway. The brush back of the Highland Oaks auto camp was backfired. Because of the trickiness of the wind, small fires started in one or two spots east of the highway but were quickly extinguished. These backfires saved the Highland court and two or three houses fronting 99. All through Tuesday the flames had been eating their way west on the ridges between Pico canyon and the Santa Susanna divide. In Pico canyon the fire had been halted on the east well of Dewitt canyon. The oil rig there was saved. But higher up and to the south the fire crept west toward the Standard lease. About three o'clock Wednesday the flames made their appearance on the mountainside south of the Standard lease and were seen to be threatening the Larinan ranch. At five o'clock Wednesday a backfire was started in the brush on the south wall of Pico canyon. This measure saved the houses at old Mentryville, the Wescott and Larinan ranches. Again at nightfall Wednesday the wind pulled around to the north. The fire front reversed and raced toward the Santa Susanna divide. Fighters massed on the ridge west of Oat mountain halted the rush by backfires about ten o'clock Wednesday night. The only open front for the fire was now on the west. Into this section poured the fire fighters Wednesday night and Thursday morning. The threat to the Pico oil wells had been eliminated by hard work and some good luck. To reinforce this line a new fire break was established. To combat the fire forces were mobilized from all over the country. The Castaic, Tuna canyon and Angeles CCC camps sent men. Lads from the juvenile camps at Chatsworth, Malibu and Arroyo Seco were drafted. Men and apparatus were rushed from other County Forestry divisions. The U.S. Ranger organization cooperated. The Los Angeles Fire Department sent two pumpers and two bull dozers. Help came from San Fernando. Eleven extra Sheriff deputies and the communications unit helped control crowds. The C.H.P. massed men on the highways. Temporary hospital stations were set up at U.S. 99 and Pico. No serious injuries were reported although several reported burns, and minor casualties among the fire fighters were numerous. When the fire was threatening along U.S. 99 traffic was shunted through Newhall. The Pico canyon road was closed for most of the three days. Fire headquarters, busy with the battle had not made a check-up of property losses. One of the old oil wells in Towsley was burned. The old Stevens property was said to have burned. The Hawes dwelling in Towsley was thought to be burned. A herd of 50 burros was reported missing. Damage to fences and phone lines was heavy. The utilities companies reported no losses. Los Angeles Times | July 26, 1940. Roaring over rugged mountain areas, vast brush blazes in the Newhall, Lake Arrowhead and San Diego areas continued to blacken acre after acre yesterday as exhausted fire fighters called for additional support and forestry experts used all available equipment to halt the racing flames. A fourth blaze in the Los Padres National Forest, between Frazier and Alamo mountains, was reported "under control" after destroying 2,500 acres of watershed and menacing Los Angeles-Bakersfield highways, and a fifth conflagration that leaped across the Mexican border was subdued by the entire population of Jacumba, 60 miles east of San Diego. Other smaller fires in Shasta, Riverside and San Luis Obispo counties also were reported extinguished or under control. Leaving a blackened, smoking wake of more than 10,000 acres, the fire south of Newhall hurdled a firebreak at the head of Pico Canyon and started eating its fiery way down the south side of Oat Mountain, county authorities reported. The outbreak, which menaced several ranches, including Hoot Gibson's, was fought desperately by rangers, C.C.C. youths, volunteers and oil company workers who last night had the conflagration checked on an eight-mile front. Although still blazing, the fire was brought virtually under control by a dramatic stratagem in which Government Meteorologist F.C. Crombie successfully predicted a southwest 30-mile-an-hour wind and the fire fighters hastily constructed a firebreak. A heavy fog blanketing Santa Susana Pass aided the fire fighters by checking the flames hut hampered them by making the firebreaks difficult to maintain. Two Standard Oil Co. wells in the Pico fields in Pico Canyon burned. A second head of the fire drove northwest to within three and a half miles of the Ventura County line, according to the Sheriff office, where authorities said workers were being recruited in San Fernando and other valley cties to help the 700 tired tire fighters already on the blazing eight-mile front. The blaze broke out in Towsley Canyon last Tuesday and probably will continue to burn all day today, officials said, because shifting winds and inaccessible terrain make difficult the use of backfires and pumping equipment. Although the flames ran up one side of Oat Mountain, scorching the ranger lookout station on its top, and down the other, no serious damage to buildings was reported and no towns in the district were in immediate danger. Still burning but said by authorities to have been checked and nearly controlled last night was a fast-moving fire seven miles north of Lake Arrowhead which has swept over 10,000 acres of pinon growth and dense brush and reached some heavy timber. The blaze stubbornly resisted all efforts of 1,500 fire fighters. Burning since last Monday, the fire has not endangered the Arrowhead resort, according to Federal Forest Service fire fighters, who said leaders from all parts of the State are flying to the fire front by plane to aid in the battle. Blazing along a two-headed strip more than seven miles long, another brush blaze was being fought 12 miles northeast of Julian by 100 C.C.C. youths and forestry crews. Flaring up in Grapevine Canyon, the fire extended in two directions to burn over more than 7,000 acres. One spearhead raced southeast up Grapevine Mountain while the other extended north to Montezuma Valley in the rugged hack country east of San Diego. The fire that menaced the town of Jacumba was halted almost at the very edge of the residential area after partially destroying a grove of juniper trees and a 5,000-gallnt water tank tower. Damage was estimated at $400. Standard Oil Fire Loss May Be $25,000. Twelve Wells in Pico and Wiley Canyons Ruined — Heavy Fog of Thursday Night Helps Stop 7,200 Acre Blaze. The Newhall Signal and Saugus Enterprise | Friday, August 2, 1940. Inspection of the twelve oil wells in Pico and Wiley canyons destroyed in the great fire of last week revealed that the loss to Standard Oil may reach $25,000. In addition to the loss of the derricks, floors, sills and pumping equipment, the tubing dropped to the bottom of the holes and will have to be fished if the wells are ever put back into service. A total of twelve rigs were destroyed according to Josh Wooldridge, superintendent of the field. Eight of the wells had wooden derricks and four had floors and pumping heads. All of the damaged wells were in the old Pacific Coast Oil Co. field, ten on the south side of Pico canyon and two on the east side of Wiley. In addition to the two wells in Wiley canyon a pumping house and gas engine were destroyed by the flames. The destruction of these wells was almost the last outburst of the fire before it was put under control. The flames reached the structures shortly before a heavy fog came over the mountains late Thursday night. This fog dampened grass and brush in the path of the fire and slowed its progress down so that fire fighters could halt the western spread of the fire front. By noon Saturday the flames were officially announced as under control. Loss of the oil wells came only after desperate efforts had been made to save them and after the flames had twice been halted. Hundreds of men had been rushed into the area by the county organization. Standard Oil also had a force of over a hundred men on the job. At Forestry and Fire Headquarters the total area burned over was estimated at 7,200 acres. Outside of the Pico Oil Field not a single dwelling or structure of any size was destroyed. As far as could be learned no stock was lost. This war attributed to the fact that practically all property was located on the outside boundaries of the fire where the firemen could make a defensive stand. The burned over area is roughly bounded by U.S. 99 on the east, Pico canyon on the north, and Santa Susanna ridge on the south and an irregular line from the head of Pico canyon up to the main ridge as the western limit. Thursday afternoon saw two dramatic and spectacular struggles, the first was at Oat Mountain and the fire road running along the main ridge. Here the flames came clear up to the look-out tower, which was only saved by the hardest kind of work. A little west of the tower the fire "slopped over" the crest and began to run down the south side of the mountain. A bull dozer was hurried into service to make a new fire break around this fire. In a difficult spot the cat slipped a tread and was stuck in the path of the flames. Pumper hoses luckily were able to reach the spot and save the machine. Extraordinary efforts held the "slop over" to about five acres. Extraordinary efforts also saved the buildings of the Orcutt Ranch Thursday afternoon. Backfires all along the fire road to the west prevented the fire from crossing at any other place. The second dramatic struggle was that to save the Pico Oil field. This field was first threatened Tuesday afternoon as flames curled around the high ridges to the south of the canyon. Again on Wednesday night the fire front marched against the field and it was thought to be doomed, but good luck and hard work showed down the blaze. Thursday morning the fire was back again and creeping down the south wall of the head of Pico canyon. Heavy fire fighting forces were thrown into the area, but the hardest kind of work could not stop the fire from eating down one side of the canyon and taking the wells on that side. None of the structures in the bottom of the canyon or the north wall were touched. The heavy fog and cooler weather of early Friday morning came as Godsend to the weary men who had been combatting the flames since Tuesday. The temporary fire breaks they had managed to make held at last. By Saturday the extra men and equipment concentrated at the fire camp in Wildwood canyon began to move out. A heavy patrol however was maintained in the fire area where individual trees continued to burn, and where occasionally an "island" of brush, missed by the main sweep, burst into flames. All during the four days of the fire the CCC camp was a hive of orderly activity under the general direction of Assistant W.G. Frownfelter. Here the crews were fed and rested and marshalled in and out. The boys much appreciated a big supply of coffee and doughnuts which was brought out by Mrs. Curtis Lewman. Losses to vegetation and wild life in the 7,200-acre area burned over in last week's big fire were believed to be heavy. Forestry men declared that thousands of rabbits met death in the flames, and they feared that a large number of deer were also lost. The fire destroyed all feed and forage for wild life. State fish and game men Wednesday distributed 500 pounds of grain in the area to provide food for quail. The effect on the watershed will depend on the way the rains come this fall and winter. In some places in the Towsley canyon area the ground is covered with five inches of ashes. Sudden heavy rains will scour the denuded hill sides and wash this material away. On the other hand showers coming gradually will leach the ashes into the earth and make for a quick growth of grass and cover. Grass Fire Escapes Control, Takes Three-Room House. The speed with which fires travel in dried grass this year was graphically illustrated just before noon Thursday when a fire started by a crew from the County Weed Abatement department got away from them and ignited a three room house at 912 Atwood boulevard. Before the big county pumpers could get into action the house and two outbuildings were a total loss. The abatement crew was burning off lots near the house when a sudden change of wind took the fire away from them. The property belonged to Frances Riccy. The damage was not estimated. The owners were not at home when the fire took place.